Location: South of Nanaimo, B.C. Getting There: Take the ferry from the mainland to Duke Point and drive south to Quennell Lake. Some of the surface algae on Quennell Lake. Note the line streaks through the middle. Quennell Lake is an odd-shaped lake on central Vancouver Island. 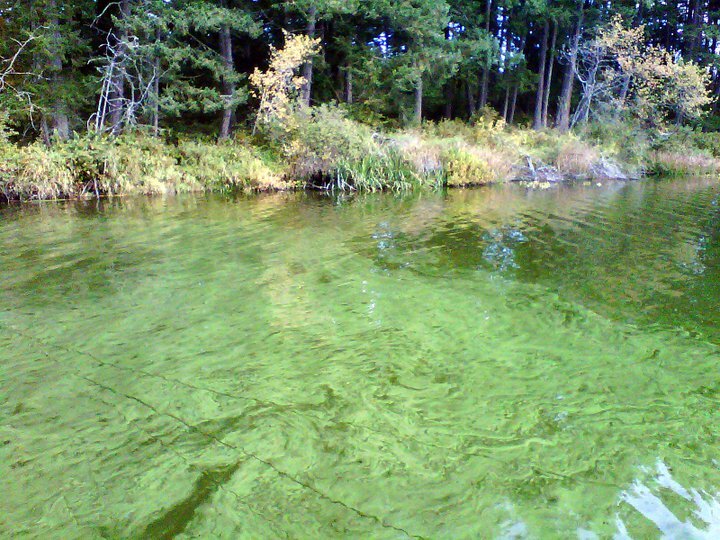 The water is a tannin colour and is very prone to algae blooms, even in the winter. Fishing this lake mid-summer can be an exercise in patience as seemingly each cast can end up with a load of green goop on the end of your hook. 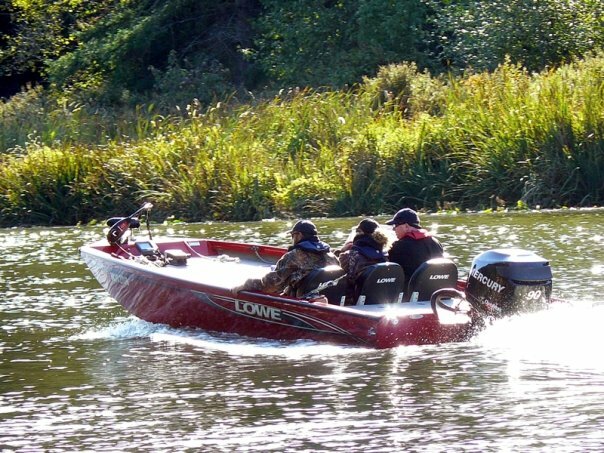 However, it's also one of the premier bass lakes on Vancouver Island. The average size of the fish is impressive, as a 4 pound smallmouth won't turn any heads, and when you find the right spot it can seem as if 3 pounders are automatic. There are also enough brutes out there to keep things very interesting, and the second biggest smallmouth bass I've ever encountered came on a spring day from this lake while fishing out of one of the rental boats. A 6 pound 5 ounce brute which fell to a black tube jig. It bit near the launch and while fighting it the caretaker of the local campground came down for a look, while she admitted it was big she also told me that she's "seen bigger." Wow. This smallmouth may be over 4 pounds, but it still falls within the average size for Quennell. As far as facilities are concerned, Quennell is a fisherman's dream. The ZuiderZee campground lies right on the shores of the lake and allows campers to park their boats on the shore in front of their campsite. They also have rental boats if you don't have your own or are looking to save some money on the ferry over to the island. The campground also hosts an annual Father's Day derby, which attracts an average of 200 boats to the medium-sized lake. From what I've heard, it's a bit of a gong show so the angler looking for a little relaxation should steer clear of this weekend. During the warmer months, bass relate to wood structure in Quennell. Casting jigs or texas-rigged tubes to shoreline wood structure works really well. Bass can be right against the bank, and often relate to vertical structures just off of the bank. Look for any irregularities in the bank and take several casts to each. Watching your line is key as it will jump when your lure gets bit. As soon as you see it hop, set the hook! The good thing about the smallmouth here is that although they sit in similar structure to largemouth, instead of diving into the cover once hooked, they swim away from it so I don't hesitate to use lighter line in the 8 to 12 pound range. I like the 4 inch tubes for Quennell because they seem to catch bigger fish. I use Lindy internal rattle weights inside my tubes and fish them on 3/0 Mustad Big Mouth tube hooks because I can get snagged all day and the hook point stays sharp. For tube fishing I use a 7' medium action Quantum PT Tour Edition spinning rod with a 30 series Quantum Kinetic. When I'm fishing a jig in the heaviest cover I will use 20 pound Trilene 100% fluorocarbon with a black/blue jig, it seems to be the best colour. I like the Strike King Pro Model Denny Brauer jig in 3/4 oz. Any trailer will do. For my jig rod, I use a 7' medium-heavy Tour Edition casting rod with a Quantum Accurist PT baitcaster. If you are heading to Quennell Lake and have any questions about the fishing you can email Chad at chad.keogh@gmail.com. 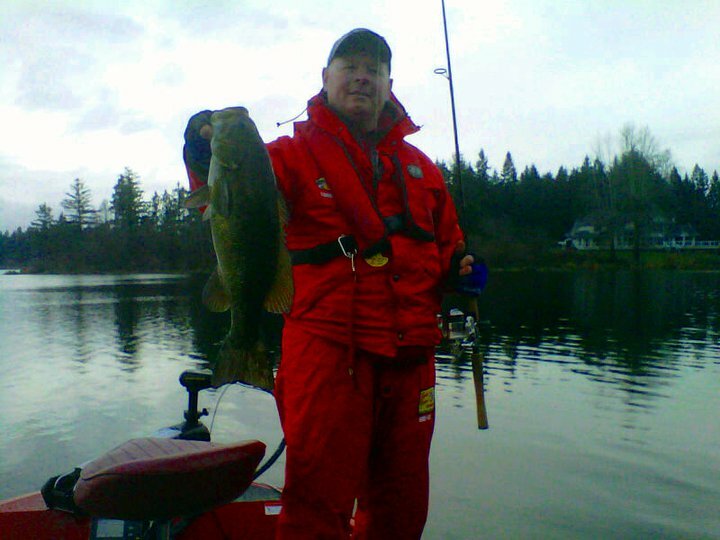 Chad with a December bass out of Quennell. Vancouver Island is home to the warmest winters in all of Canada. Quennell Lake is also known for its decent trout fishery which sports both rainbow and cutthroat varieties to 5 pounds. It is a popular choice for fly anglers who target both species and even catch the occasional smallmouth on leech patterns. 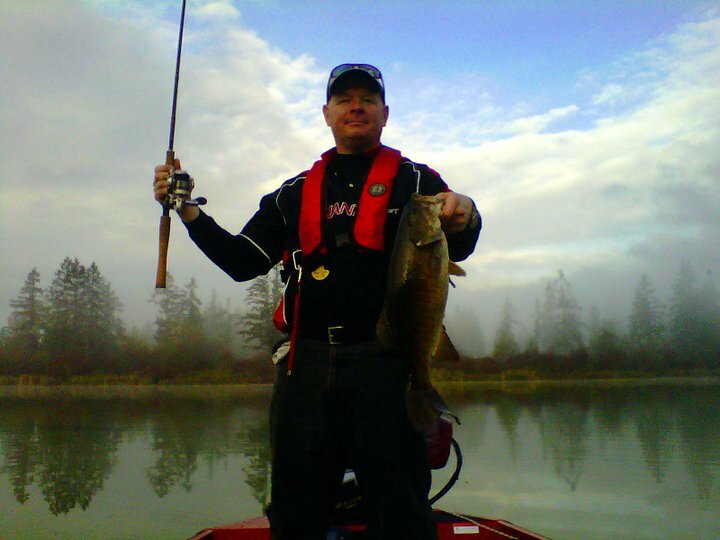 Island Outfitters tackle shop in Victoria carries a good variety of bass tackle and is a great place to stock up. Nanaimo has both Gone Fishing and Wholesale Sports which both carry bass gear. If you're coming from the mainland check out Reaction Fly and Tackle off of exit 95 in Abbotsford, or Riverside Fly and Tackle of exit 45 in Port Coquitlam. Regulations: There is a speed restriction on certain parts of the lake, particularly the channel to the left of the boat launch. Check out the shoreline cover in the background. Much of Quennell Lake has a dropoff right at the banks, so anglers should expect to fish these smallmouth like largemouth when they're shallow. Each require free membership, so you'll have to sign up before you vote.